Specific activation of the posterior precuneus associated with perception of shogi patterns. Left: Activations in the posterior part of the precuneus in a professional player. Right: Time courses of fMRI responses to stimuli of different categories in the posterior precuneus of single subjects representing two subject groups, repectively. Gray bars indicate the stimulus presentation period, and error bars indicate SEM across blocks. (PhysOrg.com) -- New findings reported last week in Science by Japanese researchers at the RIKEN Brain Science Institute (BSI) shed first-ever light on the neural mechanisms that enable board game experts to quickly generate optimal moves. Results identify specific brain regions involved in granting shogi masters their superior skill, offering insights into the neural origins of expert intuition. 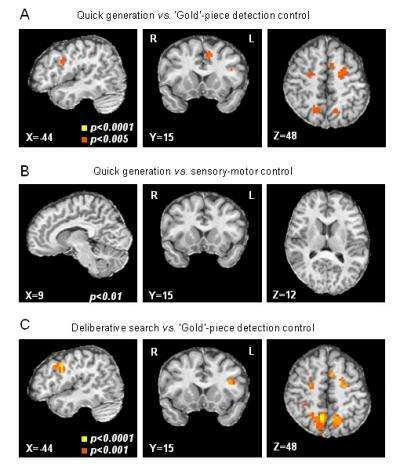 Activations associated with quick generation of the best next-move and deliberative search in professional players. (A) Activations associated with quick generation of the best next-move. (B) Only the activations in the head of the caudate remained when the activations during the quick generation of the best next-move were contrasted to the activity during the sensory-motor control task. (C) Activations associated with the deliberative search. Activations associated with quick generation of the best next-move and deliberative search in amateur players. (A) Activations associated with quick generation of the best next-move. There was no significant activation in the caudate head. (B) There was no activation when the activations during the quick generation of the best next-move were contrasted to the activity during the sensory-motor control task (p > 0.01). 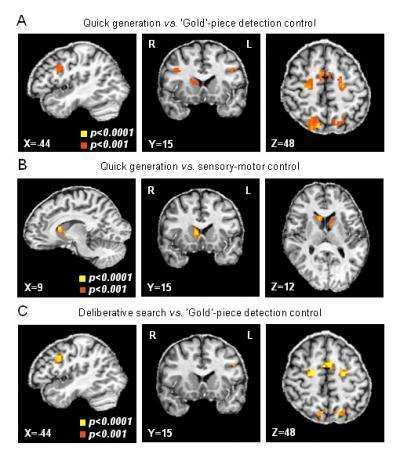 (C) Activations associated with deliberative search.